This is a Victoria plum of a collection - superbly documented, definitively performed and unrelentingly enjoyable. Recording quality is inevitably a bit variable but the sound is at very least good - often much better. It is a pity that dates and locations of recording schedules are not given however by the sound of it these recordings date from the 1970s and 1980s. It is good to see David Measham's name among the list of conductors. His recordings on Unicorn LPs never made it to CD, more's the pity. We very much need his versions of Vaughan Williams' On Wenlock Edge (with the superb Gerald English - such an intelligent artist), Wilfred Josephs' Requiem and Symphony No. 5, the Barber Symphonies and Essays, Bax Symphony No. 3 and Goossens Symphony No. 1. Whatever happened to the masters of these recordings? In this case Measham conducts the two Carmichael concertos which are the most substantial works on this set. Each concerto runs to about 25 minutes and the WASO plays the Carmichael Country Fair with Richard Mills conducting. Neither of the concertos is desperately original but each has some wonderfully accessible material. I can imagine these works making an indelibly good impression in an orchestral pops concert. The Folklorico is played by the composer and is revealed as a work in candid tribute to de Falla's Nights in the Gardens of Spain. Other 'Iberian' influences also thread their way through this work including Ravel's Rhapsodie Espagnole and Massenet's dances from El Cid. The Trumpet Concerto has similar charisma - the first movement is very singable. Overall this work rattles along like some progeny of Richard Strauss's Le Bourgeois Gentilhomme, Haydn's Trumpet Concerto and Rachmaninov's Second symphony if that doesn't sound too improbable. This is not for the irredeemably serious. Great playing from Kevin Johnston. Brumby's Scena is beautifully projected by soloist Barry Davis. The work makes a nice twin to another neglected bon-bon; Jean Francaix's L'Horloge de Flore - try it! Brumby also has the place of honour on the first disc with tracks 1 and 2. The Paean is a brash ceremonial statement welding together Baroque strains and a sort of variant of Walford Davies' RAF March Past. An English voice predominates in the Festival Overture, as well, with the tune I Love my Love (as delectably used by Holst) much in play. A Gallic wistfulness languishes over the pages of A Country Fair. This must surely refer more to a fair country than to a country fair. The work is in the form of a flighty rhapsody for clarinet and orchestra. The Miriam Hyde overture is out of the Coates and Bax camps. Lindley Evans' 1945 Idyll for piano and orchestra might be expected to follow the same track as Finzi's Eclogue but in fact (whether due to Goodman's transcription or not I do not know) it is rather a florid essay, touching yes but with a decidedly Rachmaninov plangency and Delian warmth. Dreyfus's Rush (written for ABC TV) has a Victorian nostalgia about it, something of Copland's Mexico and La Cucaracha and in it there is also something of the sepia toned poignancy of the music used in NBC's major documentary series on the history of the American Civil War. Two Benjamin works kick off the second disc. The Overture we know from Myer Fredman's LP with the RPO (a Lyrita lollipop). Joseph Post directs a performance with rough edges. It lacks the fizz of the Lyrita and for that matter of the vintage Frederick Stock/Chicago version on Biddulph. The work explores territory familiar from Barber's School for Scandal overture and two overtures by Benjamin's friend, Bax: the peppy Work in Progress and the Overture to a Picaresque Comedy. It is no surprise to hear that the Benjamin used this as an overture to his own opera Prima Donna. The Fredman version is not currently accessible. For ten years now there has been a rumour, gradually fading, that Lyrita will reissue this on CD with Barry Wordsworth's very fine 1992 account of the Benjamin symphony (LPO)and Del Mar's version of Cotillon. From effervescence to neo-classicism: Cotillon is based not too tightly on original eighteenth century dances. You will know what to expect if you are familiar with Moeran's Serenade, Rubbra's Farnaby Improvisations, the outer movements of Finzi's violin concerto, the double violin concerto of Gustav Holst and the full orchestral version of Warlock's Capriol Suite. The work has a dab of Pulcinella here and a touch of tenderness there. Patrick Thomas is more successful than Del Mar in conveying the sheer zest of this work. Hamner, like Benjamin and Glanville-Hicks had strong British connections. Phil Scowcroft has written up some biographical background which I append to this review. The Blue Hills Rhapsody uses a pastoral melody, brief but potently memorable. It hints at Wagner's Siegfried Idyll and then floats off into lush English pastures. Blue Hills was a long-running ABC radio serial. The theme was written by Hamner and expanded into this Rhapsody which at one point seems to jump through at least one Korngoldian hoop - like a fugitive from the Sinfonietta and at another to saunter through the lobby of the Grand Hotel. 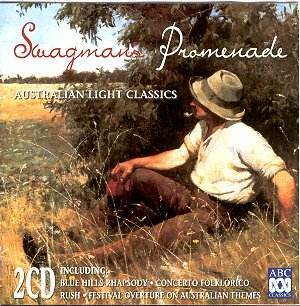 Hurst's Swagman's Promenade (which gives the set its title) is an uproarious and raucous medley of unmistakably Australian tunes that are now so mingled with the Aussie 'way' that they might easily be taken to be folktunes - Waltzing Matilda, Botany Bay, Click Go the Shears all put in bucolic apparel. Peggy Glanville-Hicks Gymnopedies are not twins with the Satie works. They reflect the composers long-time interest in Mediterranean culture and music intertwined with her grounding in the music of Vaughan Williams (Symphony No. 5). The oriental tone in these works is as tangy as in her song cycle Letters from Morocco. If you are one of the thousands who have bought the Marco Polo British Light Music series, or the three Hyperion (Ronald Corp) discs or the blizzard of EMI light music reissues this selection is definitely for you. The recordings are culled from the coffers of the ABC archives. The whole anthology is swept onto two green camouflage fatigue discs accommodated in a single width case. A resounding welcome for this set. An enquiry to Steven will I am sure give you all the information you will need about ordering. 1300 360 150 Fax completed order form anytime night or day. Overseas orders incur economy airmail charges. Ronald Hamner, born in Reigate in 1917 and who died in 1996, has been known for perhaps half a century as a highly regarded composer and arranger for light orchestra, his output in this area alone totalling well over 500 items, including some forty of the well-remembered (by me at least) arrangements for the ITMA programme. Hamner studied at Blackheath Conservatory and was a theatre organist between 1935 and 1948. Since then he has found plenty of work as a freelance orchestrator and conductor. Music has been provided by him, for films, theatre (including adaptations for amateurs of musical shows - Viva Mexico! and The Merry Widow are examples) and radio. His orchestral tally has included potpourris, with titles like Bouquet de Paris, Capstan and Windlass, The Heather and the Thistle, Heritage of England, The Holly and the Mistletoe, The Oak and the Rose and Memories of Hungary, and original genre pieces in orchestral or piano versions such as On a Windy Day, Limelight Lady, Dot and Carry One, Pastorale, Mosquito, City Desk, The PC 49 Theme and Fashion Parade. Wind players have had particular cause to be grateful to him as many publications, useful both as instructional pieces and as concert items, have come from his pen: clarinet quartets and trios, flute trios, a Cuckoo Quartet (for two flutes and two clarinets), Two Contrasts for oboe and piano, trumpet trios, a Suite for French horn and piano, direct in its appeal, and Three Sketches for trumpet and piano. I heard the Suite for Seven (i.e. two flutes, oboe, three clarinets and bassoon) twice in Doncaster recently and was taken with its good writing and melodic and rhythmic interest; there is a Serenade for Seven also. Hamner is well respected as a composer in the brass band world, where his output ranges from light genre pieces (Latin Americana, Brass Spectacular, March With a Beat, Waltz with a Beat, Mexican Fiesta and the march, Over Hill Over Dale) through solos (Praeludium and Allegro) for trombone, Cavatina and Allegro for E flat horn, Arioso and Caprice for horn and Flight of Fancy, for cornet and euphonium) to more substantial works: the fantasy Alice in Wonderland, The Four Corners of the World, Down Under (he emigrated to Australia) and Episodes for Brass. Nor have smaller brass groups been forgotten by him, as he published Prelude and Rondo and Seven Up for septet, Prelude, Romance and Finale for brass quartet and the cornet quartet Foursome Fantasy.